This article is indeed about the fabrication of transistors, but also aims to show how the development of fabrication technology proceeded from the very first transistor in logical stages, and enabled various technologies to develop into practical applications that have influenced electronic circuit design right up to the present day, including integrated circuit chips containing billions of transistors per chip. Broadly speaking, there are two dominant types of semiconductor amplifying device, the bipolar junction transistor, and the field effect transistor. Beyond the fundamental devices, they have been developed into a variety of different implementations and have been integrated onto semiconductor chips with ever increasing densities. The key to understanding all of this is to understand how the basic bipolar and field effect device were created. A conventional bipolar junction transistor (BJT) is made up from a triple sandwich of alternating P-type and N-type layers, which can be arranged in either P-N-P or N-P-N order, and there are electrical connections to each layer. 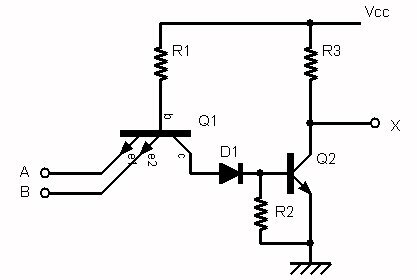 It is a current controlled device, with the collector or emitter current as output, normally controlled by the base current, or sometimes the emitter current. Generally speaking it is a low impedance device, although circuit techniques can be used to create high impedance inputs. A field effect transistor (FET) is made up from a source and a drain region of the same type (either N or P), and a conduction channel between them, again of the same type (although in the enhancement mode FET, the intermediate channel is electrically induced, as will be explained later). The resistance of the conduction channel is controlled by the voltage on a gate electrode close to, but electrically isolated from, the channel. It is a voltage controlled device, and input impedance at low frequency is high, as there is virtually no DC current flow into the gate. However, at high frequencies the AC impedances can be very low. The way in which the N-type and P-type layers are fabricated to create a BJT or FET varies, and has developed as permitted by available technology- the trend being towards creating devices with smaller physical dimensions, which generally permits faster operation, because (a) it takes less time for holes and electrons to cross regions of the transistor, and (b), the stray capacitances and inductances are smaller. Although other types of transistor exist, such as the unijunction, the triac, and the IGBT, the BJT and FET account for most applications, and form a basis for understanding the more exotic varieties. William Shockley's original transistor was fabricated by creating two gold contact points, very close together (about .002 inches), from gold foil on a plastic wedge (the closely-separated contacts being made by cutting the foil with a razor blade). 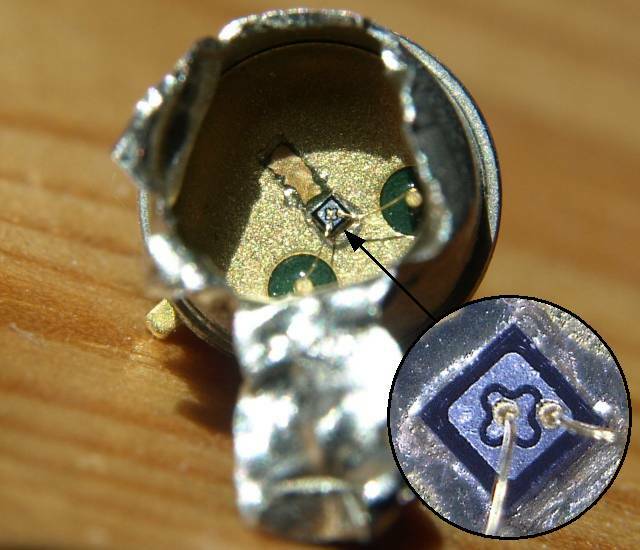 These contacts were made to a slab of germanium, which rested on a metal base- hence the name "base" for the control electrode of the transistor. You might notice that it doesn't really have the three layers of the conventional junction transistor- it was a pioneering stage in transistor development, leading to the junction transistor. The gold contacts were in the form of parallel lines. Later commercially manufactured point-contact transistors were based on similar principles, but the contacts were made using pointed wires fused close together on a semiconductor wafer. Shockley, Brattain and Bardeen received the Nobel Prize for their work in 1956. The germanium crystal is N-type. A thin P-type layer is formed on the surface, by suitable surface treatment (Sometimes, a surface effect exists on an N-type crystal where a P-type layer forms spontaneously, which allowed P-N junction effects to be observed in experiments even without deliberately forming a P-type layer). 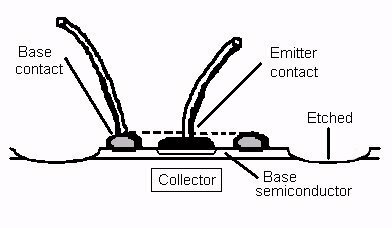 Assume no bias connection to the emitter for the time being, and consider the collector is biased in the reverse direction (negative), which supplies electrons to recombine with all the holes under the collector (effectively "collecting" the holes). After recombination, there are no free charge carriers under the collector, so no current can flow. If we now bias the emitter in the forward direction (positive), any available electrons flow out of the emitter, effectively injecting holes into the surface layer of the crystal, augmenting the P-type layer under the emitter. This layer conducts as the holes are the natural current-carriers here. Having said that no current can flow via the reverse-biased collector, now that the emitter is injecting holes nearby, the electric field set up by the collector causes holes to flow to the collector, and this results in an amplified signal in the collector circuit. Unlike junction transistors, the point-contact transistor could have a current gain greater than one, presumably because further current could flow from base to collector. To attempt to gain a better understanding of how the holes introduced at the emitter contact caused an amplified current to flow to the collector, Shockley devised the junction transistor configuration, simply a sandwich of P-N-P or N-P-N layers, where the transistor action could be made to work in in the bulk of the semiconductor, and so the junction transistor was born, which is the predominant type of bipolar transistor today, the point-contact transistor not being very useful for practical purposes. The first junction transistors were grown-junction types, made by growing a crystal pulled slowly from molten semiconductor, which starts out containing impurities for the P-type, then changed to N-type, then back to P-type. This created a PNP sandwich which could be cut into individual transistors. However, it was difficult to make contact with the base layer, and the frequency response was limited. The first alloy junction transistors were made at General Electric under R. N. Hall. These created a PNP (or NPN) junction in a single wafer of one type of doped semiconductor by allowing a small pellet of doping material, such as Indium which dopes to P-type, to alloy with the semiconductor wafer on each side of it. As the Indium atoms diffused in to the semiconductor, they created a region of P-type semiconductor on either side of the wafer, and between them, the remaining N-type material formed the base of a PNP transistor. The base layer could be made thinner than for the grown-junction transistor and this improved the high-frequency performance available from the transistors. 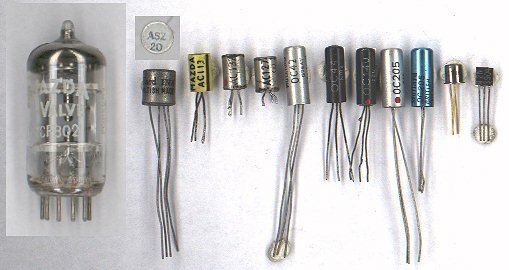 From around 1955 to the 1970s, a range of germanium alloy junction transistors manufactured by Philips in Holland became popular, and very well-known to the electronics engineers of the period, in particular the OC70 and OC71 (audio frequency), the OC72, OC78 and OC81 (audio output), and OC44 and OC45 (radio frequency, albeit to much lower frequencies than many contemporary "low frequency" transistors). 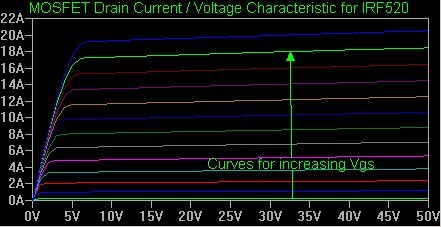 The OC71 could handle a 50mW power dissipation, Vce(max) of 20 V, and Ic(max) of 10 mA, and had a DC current gain (HFE) between 30 and 75. These were manufactured by slicing up zone-refined and antimony-doped monocrystalline germanium ingots (N-type) into wafers of about 0.5 mm thickness, which were then further polished and diced into chips of about 2.4 mm square (1.5 mm diameter circular chips were machined for the OC44 and OC45). After dicing, the pieces were further thinned by chemical etching down to 0.1 mm. Small indium pellets were fused to the germanium chips in a furnace, with temperature and exposure time closely controlled to determine the depth to which the indium alloys with the germanium chip. Each transistor chip was mounted to its lead wires by a person working with a microscope to bond the lead wires to the collector, base and emitter, and the transistors were sealed in a glass capsule about 15mm long and 6mm in diameter, which had to be filled with a silicone compound to conduct heat from the chip to the case, and painted to prevent light exposure, as the devices were quite photosensitive. The circular RF types had a ring metallisation contact for the base electrode, which enhanced high-frequency performance as it minimises the parasitic base resistance. The alloy junction transistor was improved on in the mid 1950s by Herbert Kroemer at RCA labs, who developed a transistor whose impurity concentrations in the base wafer varied, with a high impurity concentration near the emitter, and a low concentration near the collector (similar to "double-diffused" transistors), which created a built-in "drift-field" that improved the high-frequency performance an order of magnitude over alloy-junction devices, and these were known as "alloy-drift", "diffused-alloy" or "drift" transistors. The RCA 2N247 was an example of this type. Kroemer (with others) received the Nobel Prize in Physics in 2000 for his work on semiconductor heterostructures. On the left is a PCF802 valve for comparison, which contains a triode and a pentode, designed for line timebase oscillators in televisions, and a type in common use in the 1960s. The size advantage of transistors - even for the larger early types - should be obvious. I will describe the electrical behaviour of the junction transistor in terms of the common base configuration, for comparison with the point contact version. When connected with the base grounded, current flow into the emitter passes into the base, and mostly diffuses to the collector under the attractive field of a reverse bias voltage, with a small proportion of electron flow leaving via the base (i.e. a small conventional current flow into the base). The gain exhibited by this device comes from energy supplied by the collector bias voltage. 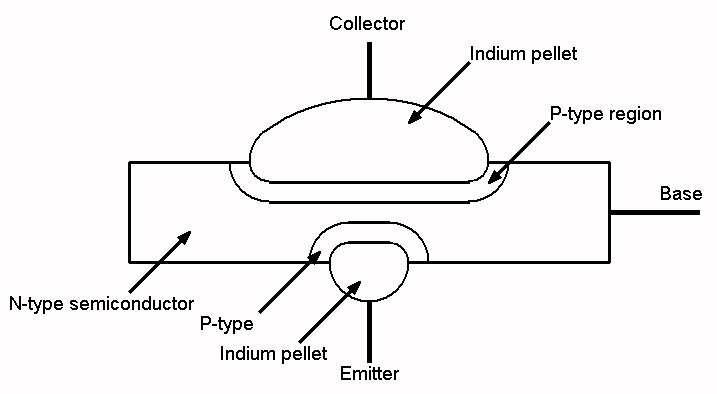 Although the electron flow injected into the emitter is slightly higher than the flow leaving the collector, the voltage swing of an AC signal is considerably larger at the collector. Another way of looking at it is that the forward-biased emitter-base junction has a low AC resistance, while the reverse-biased collector junction has a high AC resistance, and with a similar current on both sides, the AC voltage must be higher on the collector side. This was a kind of transfer of resistance effect (transresistance), and it suggested the name for the transistor, named by John Pierce of Bell Labs in 1948. The diffusion method for manufacturing junction transistors, pioneered by C. A. Lee at Bell Labs, uses a vapour of the impurity atoms surrounding the semiconductor material as it is heated, so that impurity atoms can diffuse in to the crystal lattice of the semiconductor. Thus, a region of N or P type semiconductor can be diffused into a block of pure intrinsic semiconductor, or (if the concentration is large enough) can change an existing N-type into P-type (or vice-versa) by providing more sources of holes than electrons. The diffusion process can create very thin, well-controlled layers, which is highly desirable for creating base regions for high gain and high speed response in circuit applications. Epitaxy is basically the growth of one crystal layer on the surface of an existing crystal, in which the growth of the deposited crystal is guided by the lattice structure of the underlying substrate. It is used extensively in microelectronics in the fabrication of transistors, integrated circuits, light-emitting diodes and other devices. In the mesa transistor, the diffusion process has been used to create the base layer, and a central emitter region created by either alloying in an emitter, or diffusing in another layer of opposite type to the base layer, and making a contact to it. The base contact is made by a ring of metallisation (note the similarity to the high-frequency alloy-junction base contact), shown by the dotted line. To precisely define the area of the transistor, and avoid excessive parasitic capacitance, the semiconductor chip is selectively etched, using a photomasking process, around the base contact ring to isolate the active area in the shape of a mesa. The transistor chip is mounted on a metal surface to make contact with the collector and provide an efficient heat sink. The improved thermal bonding of the mesa chip to the case compared with the alloy-junction type, and the use of silicon rather than germanium (which has lower leakage current at high temperature) enabled the devices to dissipate higher powers and have higher current ratings, for example, the early 2N497 device was rated at 200 mA collector current and 4W power dissipation. Examples of mesa transistors include the 2N497, 2N696, 2N697, RT409, 2N706c, 2N834, 2N1131, 2N1132, 2SA161 (Ge) and 2SC41. The first diffused-base germanium mesa transistor was created in 1954 by Charles A. Lee at Bell Labs, which had a cutoff frequency of 500 MHz. This was another order of magnitude improvement in the frequency response compared with the alloy-drift transistor. Fairchild Semiconductor, founded in 1957 by a group from Shockley Semiconductor Laboratory, produced the first commercial silicon mesa transistors, and went on to invent planar epitaxial technology in 1959, and brought devices based on this technology to market in the 1960s. The new process eliminated the need for an etching stage to isolate individual devices. Their patented process gave Fairchild a competitive lead in the industry for many years. This planar process essentially formed the basis for making practical integrated circuits. The 2N3053 is an example of a popular epitaxial planar NPN silicon transistor in a 3 pin TO-5 (TO-39) case, with a power dissipation rating of 5W when heatsinked and maximum collector current of 700mA, and is still available, although largely superseded for new designs by smaller devices with improved specifications or surface mount packages. As can be seen in the following photograph of an opened-up 2N3053, the metal can is mostly empty, acting as a primary heatsink for the silicon chip attached to its base. Jack Kilby (1923-2005), who retired from Texas Instruments in 1983, and died on June 20 2005, is credited with being the original inventor of the integrated circuit, and Robert Noyce (1927-1990) of Fairchild Semiconductor who worked on the same objectives at more or less the same time, is credited with inventing the technology for its mass-production. As well as earning a Nobel Prize in Physics in 2000 for his part in the invention of the integrated circuit, Kilby was awarded more than 60 patents, received the National Medal of Science, was inducted into the National Inventors Hall of Fame and received numerous other honours. Jack Kilby grew up in Kansas, and obtained degrees in electrical engineering from the Universities of Illinois and Wisconsin. In 1958, he joined Texas Instruments, based in Dallas, Texas. On September 12th of the same year, he successfully demonstrated the first integrated electronic circuit which incorporated active and passive circuit components, which were connected up as an oscillator, built on a single germanium semiconductor chip, half the size of a paper clip. Kilby's integrated circuits included a flip-flop and a phase shift oscillator, but interconnection had to be done by attaching bonding wires between parts of the chip. Kilby and Texas Instruments filed a patent for their invention on February 6, 1959, awarded as No. 3,138,743 in 1964. Rival Robert Noyce (1927-1990), who founded Fairchild Semiconductor in 1957 with Jean Hoerni and Gordon Moore, concentrated more on the interconnection aspects. In 1958-1959, Jean Hoerni developed the planar process, using diffusion of impurities to create semiconductor layers, and oxidation to make silicon dioxide insulation layers, to embed insulated layers of transistors and other circuit elements in a silicon chip. In 1959, Noyce developed his first IC using planar transistors, incorporating an isolation technique using back-to-back pn junctions developed in 1959 by Kurt Lehovec at Sprague Electric Co. to isolate silicon resistors, and using Hoerni's planar process with metal deposited by evaporation through a mask to form planar interconnections, which meant that the whole circuit could be interconnected at once without costly point to point wiring. Noyce obtained a patent (No. 2,981,877) for his IC technology on April 25, 1961, went on to co-found Intel with Gordon Moore in 1968, and was inducted into the National Inventors Hall of Fame in 1983. Stage 1: A chip of N-type semiconductor with a surface layer of silicon oxide (grown by heating the silicon in pure oxygen) has a window of oxide etched out photolithographically. This requires a layer of light-sensitive material to be coated on the silicon, then exposed by projecting an image of a mask on to it, such that the material can be selectively washed away depending on whether the material was exposed to light or not. This creates a photo-resist mask, which allows an etchant solution to be used to etch out the areas that are unmasked. The N-type semiconductor can be a layer diffused into an intrinsic semiconductor chip, which is known as an epitaxial layer. Stage 2: A diffusion process is used to create a region under the window that is P-type, where the impurity atoms have diffused into the silicon. The window is then covered with a new layer of oxide. Stage 3: Another photolithographic window is etched within the area of the previous one. Stage 4: Then another diffusion process is used, this time creating a layer of N-type semiconductor entirely within the previously created P-type layer. This new layer will be the emitter, and what remains of the P-type layer forms the base. The emitter-forming window is then covered with a new layer of oxide. 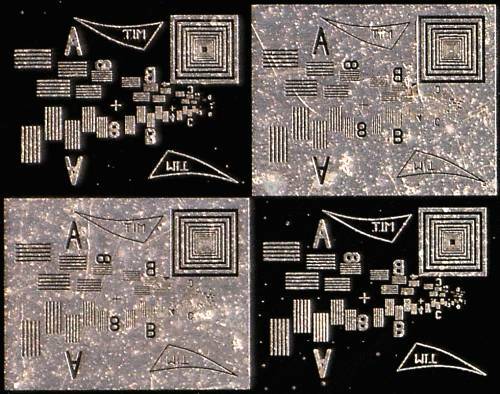 Stage 5: Photolithographic windows are etched over the base P-type and emitter N-type regions. Stage 6: A layer of aluminium is diffused on to the windowed base P-type and emitter N-type regions. A similar method is used to make contact with the epitaxial collector layer (not shown), and then very fine wires may be bonded by various techniques to provide connections between the chip and the wires or pins of the package that contains and protects it. 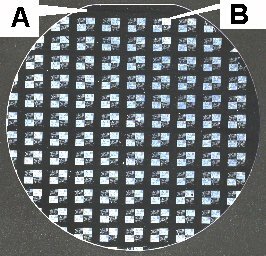 A silicon wafer is shown below, containing a number of repeated aluminium metallisation test patterns, which were used to develop a manufacturing process. 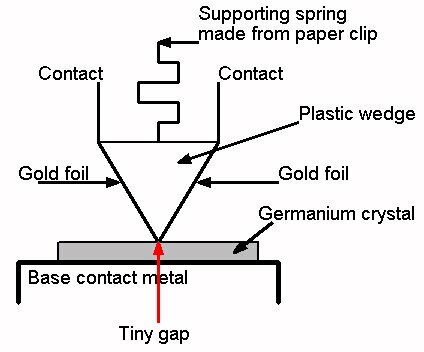 The planar fabrication process (which, unlike the mesa process, did not need to isolate the parts of the silicon wafer where the transistor was fabricated with an etched trench) enabled multiple transistor structures to be fabricated on the same silicon wafer, and they could if desired be interconnected using the aluminium metallisation layer. This was the great enabling technology for the development of mass-produced integrated circuits. These are electrically equivalent to two BJT transistors connected in parallel, except for the emitters (not to be confused with conventional transistors with multiple emitter leads, which are used to reduce inductance to a single emitter). A current from either emitter injected into the base flows into the collector (minus a small base bias fraction). These structures have an important application in digital logic circuitry, where the emitters can serve as separate inputs to a logic function, as in Transistor-Transistor Logic (TTL), which was first introduced by Texas Instruments in 1962 as the "7400 series", remained popular until the 1990s, and still has important applications (often embedded within custom ICs). Before discussing TTL further, I will briefly digress to mention their immediate predecessor technologies, which were first to be fully integrated. These devices were an early type of logic gate known as resistor-transistor logic (RTL), which had developed out of circuits that could be conveniently made from discrete resistors and transistors. The first Apollo spacecraft guidance computer used approximately 4100 RTL logic gates. RTL had poor noise immunity, and limited ability to drive multiple loads (fan-out), so buffer circuits such as this were needed to expand the number of drivable stages, provide isolation, or drive bus lines. 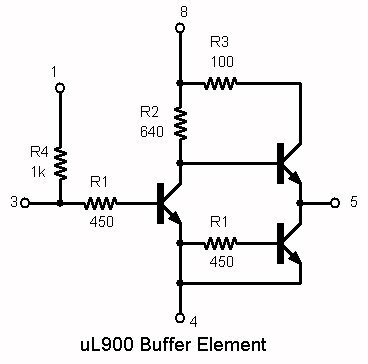 Whereas the μL914 logic gate had a fan-out of 16, the μL900 buffer could increase the fan-out to 80. 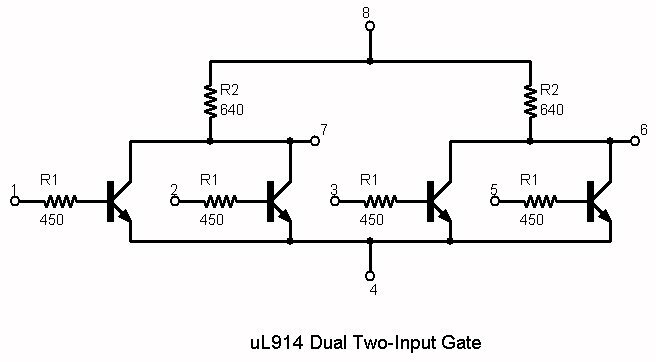 The μL914 dual two input gate could be used as a NAND or NOR logic function. If either input 1 or 2 were driven high, output 7 would be driven low. When a high voltage represents a logic 1, this is NOR function (inverted version of OR, where the output would be high if either input went high). If negative logic is used, where a low voltage represents a logic 1, both inputs must be low for the output to be high (inverted version of AND, where the output would be low when both inputs are low). 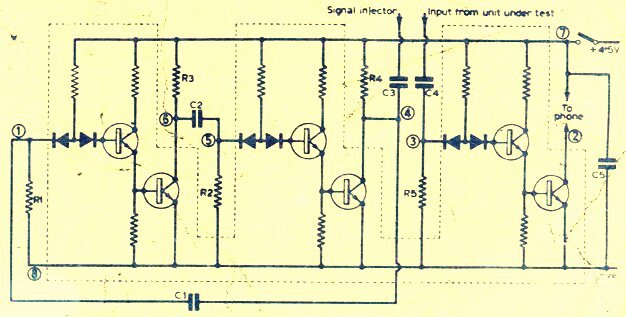 The next intermediate stage between RTL and TTL was diode-transistor logic (DTL), which used diodes to perform logic functions (diodes require less space than resistors when integrated) and was somewhat faster. Signetics launched a DTL logic range in 1962, and Fairchild launched their own in 1963, which was cheaper and outsold the Signetics devices. Ferranti produced a logic IC range in Europe in 1961, marketed as Micronor I and aimed at computing for Naval applications, followed by Micronor II, a faster DTL range. DTL had the best speed and reliability characteristics for integrated logic, at least until TTL came along. The first integrated logic devices were very costly, so were limited to applications where the advantage of integration was essential, such as space exploration. Initially, only a few logic gates (up to about 20 gates) could be integrated, so the ability to create a logic function by building it in to the structure of a single transistor itself was a great advantage. One multi-emitter transistor could now do the job of multiple diodes. The multiple-emitter planar transistor structure when used as a logic input could be connected directly to the preceding transistor output driver stage and was faster than the earlier RTL and DTL families, because the resistor elements of the input stages were eliminated, so the capacitance of the input transistor and package capacitance could be charged directly by the driver transistors. 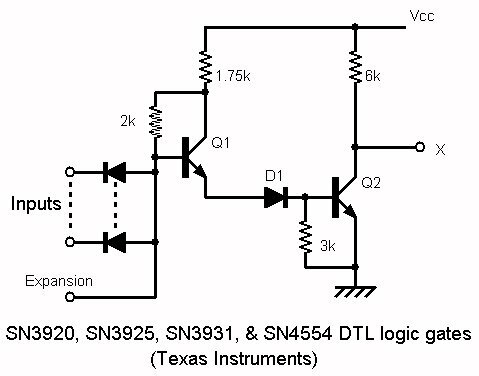 This was the Transistor-Transistor Logic (TTL) logic family, introduced in 1964 by Texas Instruments as the 7400 (industrial) and 5400 (military) qualified series. If both input A and B are high (close to Vcc voltage), then both base-emitter junctions must be below the forward bias potential, and the base-collector junction of Q1 must be forward biased via the Vcc potential across R1, Q1, D1, R2 and the base-emitter junction of Q2, which is also forward biased. A current flows through this chain, and with Q2 biased into conduction, the voltage at X is low. The circuit is designed so that in this case, the operating point of Q2 brings the collector voltage down to Vce(sat), normally less than 1 Volt. If an emitter input (A or B) is connected to a low input voltage, the Q1 base-emitter junction can become forward biased. The current from R1 into the base can now flow out through the emitter. The voltage at Q1's collector falls, as Q1 is now fully turned on and the collector-emitter voltage difference must be small, and as long as the emitter voltage is low enough, the base-emitter voltage at Q2 falls below forward bias levels, and current through R3 pulls the output X up to near Vcc voltage (as long as the output X is not loaded too heavily). Thus, if A or B is low, or both are low, X is high, and if A and B are both high, then X is low. This is the function of a NAND gate: a logic gate which generates an inversion of the simpler AND function (where the output is high if both inputs are high). We have seen how the planar epitaxial process paved the way to integrated circuits. 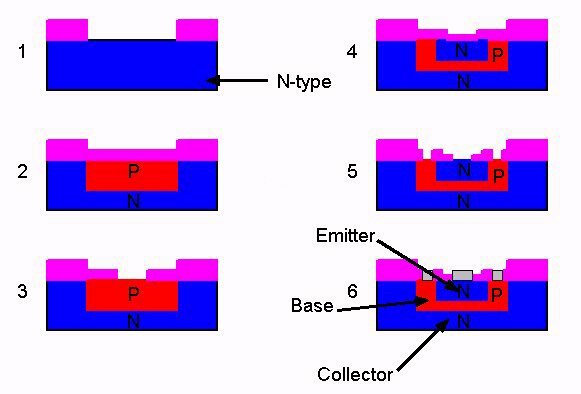 Note that a key feature of the planar epitaxial process is the use of layers of non-conducting oxide or nitride during the photolithographic stages. The process also supports the creation of electrodes separated from the semiconductor by an insulating layer. Such an electrode with a voltage applied can create an electric field in a semiconductor without conducting any current, which implies that an input could be voltage-controlled without loading the source to which it is connected, in other words a field-effect transistor. 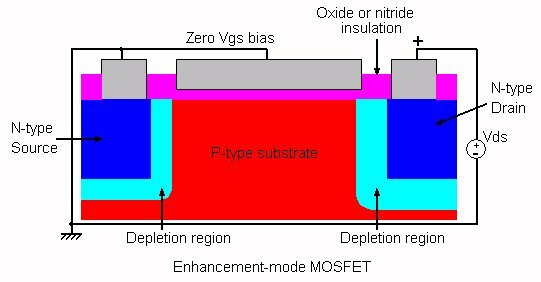 The depletion mode MOSFET was described theoretically in a patent (US1900018) by Julius Edgar Lilienfeld (1881-1963) filed in 1928, based on semiconducting copper sulphide, the conductivity of which is controlled by an aluminium electrode, insulated from the semiconductor by its surface layer of aluminium oxide. There were no practical implementations of this device, as there was no supply of high purity semiconductor material. Shockley had encountered difficulties in creating an amplifying field effect device, and the effort to do so was overshadowed when he obtained better results with the point-contact and sandwich BJT approach. The N-channel MOSFET has a drain and a source area consisting of heavily doped N-type semiconductor. Between the two is a thin layer of N-type material known as the (conduction) channel. Overlaying the channel is the gate electrode, which is insulated from the channel by an oxide layer. The implanted conducting channel was used in the earliest MOSFETs, which were the "depletion mode" variety, in which the device normally conducts fully, so that for an N-channel device a negative voltage must be applied to the gate to suppress the conduction and reduce the drain current to the nominal operating value (This channel is not present in an "enhancement mode" device, where to enable conduction, the gate must have a positive voltage bias to create an electrically-induced channel). For N-channel MOSFETs, negative gate voltages with respect to the source and substrate will attract holes from the substrate into the channel, which will narrow the channel and increase the channel resistance. Positive gate voltages with respect to the source and substrate will repel holes from the channel into the substrate, effectively widening the channel and decreasing channel resistance, although normally the channel resistance is low enough at zero-bias for all practical purposes, so that positive gate voltage is not normally required for depletion devices. For P-channel devices, all the polarities mentioned in discussion are reversed. Although conceptually the connection to the substrate is shown in the diagram as an underlying electrode, in practice with planar construction everything is usually implanted into a thin epitaxial layer on the surface of a wafer whose thickness is much greater, relatively speaking, than the thickness of the devices, so there is normally a fabrication process that allows an electrode on the surface to make contact with the P-type substrate. 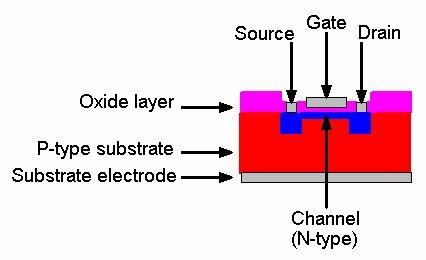 If P-channel MOSFETs are required in the same substrate, the "substrate" for each P-channel MOSFET then consists of a "well" of N-type material diffused or implanted first into the semiconductor. The electric field generated by the gate modulates the depth of the conducting N-type region of the channel. This is shown in detail below. With a positive voltage applied to the drain, current flows through the N-type channel. But with a negative voltage on the gate, current carrying electrons in the channel are repelled by the electric field, leaving an insulating depletion region which contains positively charged donor atoms, but no free charge carriers, and hence no current can flow between source and drain through this region. The higher the negative gate-source bias voltage, the further the depletion region extends into the channel, reducing the cross-sectional area available to conduct current. Hence, the FET behaves as a resistance controlled by the gate voltage. Note that the depletion region is pictured with some asymmetry, increasing in width towards the drain. This happens when the drain is biased positive, as is usual with an N-type FET used for anything other than a small-signal variable resistance, and because the effective negative bias on the gate is higher relative to the drain potential, the depletion region is wider at the drain end. 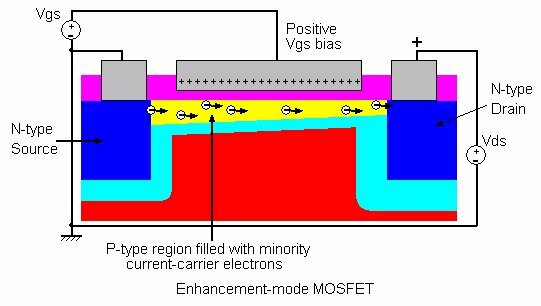 If the depletion region is a small fraction of the channel width, a change in drain voltage causes a relatively small change in the conductive area, and so the current increases as if the FET were a resistor. The following diagram shows the situation with an increased gate-source bias, which has increased the depth of the depletion layer until the conducting area is almost eliminated. This point is known as "pinch-off". If the drain-source voltage is increased when there is a "pinch-off" zone, the increased effective reverse gate bias at the drain end tends to reduce the conduction area significantly, which tends to cancel out the current increase due to increased drain voltage. In other words, the "pinch-off" zone is extended, and the extra voltage drop along its narrow conduction area almost matches the additional drain-source voltage. There is therefore a built-in negative feedback effect which causes the drain voltage-current characteristic to flatten out as the drain voltage passes the point at which there is a significant pinch-off zone. An enhancement-mode N-channel MOSFET is shown below, under conditions of zero bias. For an N-channel enhancement MOSFET, when the gate-source voltage is zero, the drain-source current is zero. A depletion region is formed around the N-type source and drain regions, because of the recombination of electrons and holes at the junction with the P-type substrate, as in a PN junction diode. A positive voltage applied to the drain reverse-biases the junction there, so no current flows. If we apply a positive voltage to the gate, above a certain threshold voltage which is around 0.5 to 3 V, the electric field created under the gate electrode repels holes in the P-type substrate and attracts electron current carriers from the N-type source (and drain, if the drain voltage is low). These electrons can now flow from source to drain when there is a positive drain voltage applied. The electrically-induced channel under the gate is equivalent to a depletion region filled with majority carriers from the source. Although these are minority carriers in the channel, all the current carriers are of the same type, unlike the bipolar NPN or PNP transistor where both holes and electrons are active. The induced channel also resembles an N-type layer although it is really P-type with excess electrons, hence it may be termed an inversion layer as it inverts P to N. Increasing the gate voltage enhances the width of the inversion layer, and requires no built-in channel, and so this is known as an enhancement mode MOSFET. 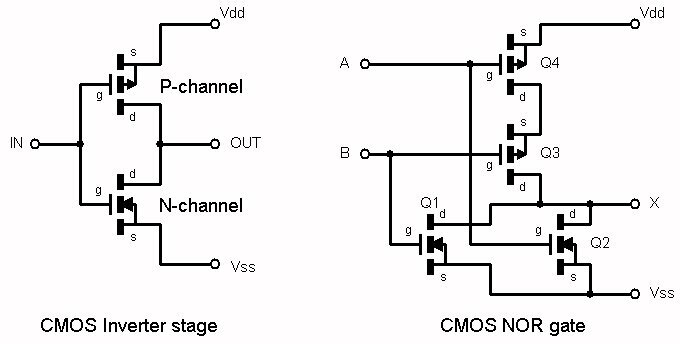 As for P-channel MOSFETs, these work in a similar way except that the N and P type regions, charge carrier types, and bias voltages are all the other way round. Both N-type and P-type enhancement mode MOSFETs may be readily integrated, and if connected as a series pair across a power supply voltage, with the P-channel device source connected to Vdd, and the N-channel device source connected to ground (or Vss) as shown in the inverter below, you will find that if both gates are connected together to Vdd, the P-channel device will be off and the N-channel device will be on, driving the output low, and if both gates are connected together to ground, the P-channel device will be on and the N-channel device will be off. This can be used as a buffer stage, to drive a load from a low-power input, or as a logic level inverter. It is the fundamental basis for complementary MOSFET technology, or CMOS, which has become the dominant logic technology today (including many derivative forms). Its advantages include a symmetrical voltage transfer function, which aids noise immunity, a high input impedance, which facilitates easy interfacing and high fan-out, a low driving impedance for both a low and a high level output, which supports fast switching, and the basic series pair structure consumes no current except when the stage is actually switching, which enabled low-power applications such as digital wrist-watches. A CMOS NOR gate is also shown above. If either input A, or B, or both are high, then at least one of the series-connected P-channel MOSFETS Q3 or Q4 must be non-conducting, and at least one of the parallel-connected N-channel MOSFETS Q1 or Q2 must be conducting, so the output X must be pulled low. If both input A and B are low, then both of the series-connected P-channel MOSFETS Q3 or Q4 must be conducting, and both of the parallel-connected N-channel MOSFETS Q1 or Q2 must be non-conducting, so the output X must be pulled high. This implements the logic NOR function (inverted OR). A practical CMOS IC inverter normally uses multiple cascaded stages (at least 3, because two cascaded inverters don't invert) to obtain a sharp transition in the input/output voltage transfer characteristic, and diode-resistor networks on inputs to protect against electrostatic damage. The unbuffered stages in devices like the SGS-Thomson HCC4007U are essentially as shown above, have slightly lower propagation delays, and can be biased into linear operation, for example to implement an oscillator circuit. Buffered logic stages normally have inverter stages added to their inputs and outputs. Photolithography using shorter wavelengths, into the ultra-violet and X-ray spectrum; Deep-Ultraviolet Lithography (DUL) has been in use with ever-decreasing wavelengths starting around 1994, Extreme Ultraviolet Lithography (EUVL) prototype equipment exists, and volume production equipment is expected to be in general use around 2007. There are already patents on gamma-ray lithography. 1959 Texas Instruments and Fairchild Camera and Instrument Corp. independently develop the first commercial integrated circuits- Fairchild's version demonstrating the first with planar metallised interconnection. 1968 RCA introduces their CD4000 series CMOS logic family, which they called "COS/MOS"
1971 Intel introduces the 4004 4-bit microprocessor, containing 2300 transistors, and considered to be the world's first single chip microprocessor. It was used on the Pioneer 10 spacecraft in 1972. 1975 IBM introduces their first "Personal Computer", the IBM 5100, which is considered to be the first portable PC (but not the first PC, which is attributed to the Altair 8800 kit launched by Ed Roberts in January 1975) based on large-scale integration (LSI): a board-level IBM "Palm" microcontroller made up from TTL-compatible 134-gate bipolar gate array technology called "Dutchess", with chips containing 60 three-input NAND gates, 40 four-input NAND gates, and 34 two-input NOR off-chip drivers, plus assorted TTL devices. 2016: Intel announced in January that its cycle for new processors will extend from 2 to 2.5 years: Intel Finally Admits Moore's Law Has Slowed, So Now What? Kahng D, Atalla MM. "Silicon-silicon dioxide field induced surface devices", IRE-AIEEE Solid-State Device Research Conference, Carnegie Institute of Technology, Pittsburgh, PA, 1960.